It is sometimes necessary to make changes to the building contract after it has been signed. If you approach the builder to make any changes after the contact is signed be aware that there may be a cost in doing so. Any requests for changes (known as variations) to the contract must be made in writing to the builder as early as possible to minimise cost and time delays. As with any contract, changes to any terms, including the cost, must be dated and signed by all the parties to the contract. Variations should not be made orally as they are difficult to prove if there are disputes.? If you discuss any changes with the builder over the telephone, confirm what was verbally agreed with the builder in writing and keep a copy of your letter for your records.? 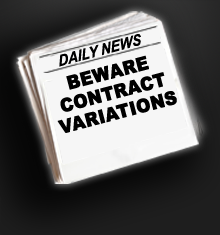 All variations to contracts between $6 000 and $200 000 must be in writing, the terms set out and agreed to by all the parties and you must receive a copy of the signed variation before the work covered by the variation begins. As part of the recent overhauls of the City of Adelaide's planning and development system one reform has gone under the radar. Height limits in the CBD have now effectively been abolished and are subject only to airport height restrictions. Now before people start worrying about skyscrapers dominating the city skyline it must be remembered that planning conditions are not the primary force determining what and when development commences. The market is the primary driver of what is built.? As long as Adelaide continues on with the same slow and steady growth in its economy, it is unlikely that it will ever be able to support the significant growth that is seen in other cities.? Basic economics will ensure that the growth of our city is steady and sustainable because if developers become irrationally exuberant they will inevitably pay the price. Some builders are offering extended warranties to their clients with many builders offering from 25 to 50 year warranties. However it is important to understand what these warranties mean. If a builder mentions a warranty period in their promotional material or when you are having your initial discussions it is important that this warranty is signed into the contract. Although just because there is not written contract of the warranty it still may be legally binding to the builder you don't want to get involved in legal proceeding where there is and uncertain outcome. In this scenario the only person who will win will be the lawyers. When signing a contract you need to ensure that you have a written warranty document so that if there is a claim in the future you can refer to this document to work out whether the builder is responsible for fixing the problem. The items that builders typically include in a 25 year warranty include structural items such as roof frames, slabs and footings. It must be remembered that if the owner has contributed to the damage of any of these items then the warranty may not be applicable. It is important to understand what your?responsibilities?are as an owner of a new home is to ensure that you fulfill your requirements to maintain the structure integrity of the building. 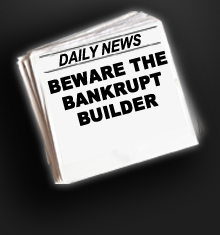 Now is a time to get some great bargains from builders but with at least 2 builders going broke each day in Australia it is more important than ever that you know who you are dealing with. As profits flatline and banks play hardball on funding latest statistics show that since January more than 363 companies in the building industry, excluding mining, have collapsed. In March there were 30 building companies that collapsed, with 33 in April, 51 in May, and 63 in June. Profit margins have continued to shrink down to between zero and 2 per cent. However it appears that the worst is far from over as in the first 10 days of July there has already been 40 building companies collapse in Australia. Like any major shift in the market it represents a time of great opportunity as well as risk. If you want to make sure when you are building that you get the best quality at the best possible price from a builder who will be there to see your project through give me a call.